Someone know who I have to contact in order to them to put the car in the plugin cz? Thanks for your work with this blog guys, I visit it everyday, and thank for give repercusion to our works. Thanks for the car (even if it's not my favorite). Thanks for the time spent on RBR. I am convinced that there is no need to deal with it. Certainly they will do it themselves. I tried to comment on gr-evolution site, but my message didn't appear. I tried again, it said, that i wrote the same post already. Secondly, I think that, if somebody ask for template is good, because they like your work, your car. Don't be disappointed about you see your car in other game! Its mean that your work is good, and unique. In these days, when 3D ripping program works well, you can't protect your model. Yes, it is a very bad habit, that today (and some years ago) "modders" convert cars from a game to game, and don't ask his original author. Or for example sombody convert the car from RBR to GTA, and then somebody convert into AC, and write only that he made from XY's model from GTA, although the readme in the GTA's version include the original author name. I'm not against the conversion, but it is the minimum, that I search the original author, and ask him to allow conversion or not, before I even post a picture of it for the public. P.S. I don't think, that other RBR modder stop making cars because of this. They are clashed with each other, or don't have time, motivation to make cars. And we are changing (and ageing) there are other priority in the life. 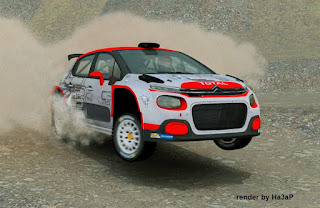 But I think RBR is still the best rally simulator for PC (especially for gravel), so we need the persons like you, who made us the new cars. "